Equipping Haiti is an Illinois based non-profit 501(c)(3) corporation founded in May of 2016 to minister to those in need in Haiti. The mission of Equipping Haiti is to help meet the physical, financial and spiritual needs of the Haitians we work with. In its short existence, through God's goodness and grace, Equipping Haiti has been able to feed more than 100 families in the aftermath of Hurricane Matthew, and provide Christmas for 50 Haitian children. Our next mission is a mission trip, leading a Bible school for children at churches in Damien and Bigarade where we will not only share Christ with more than 300 children between 3 and 15, but we will feed these children all five days of Bible school. Since the devastating earthquake in 2010, much of Haiti has dealt with little or no infrastructure including electricity, potable water and sewer service. So to assist in that area, our group will also be helping to build a public restroom for the community of Bigarade. 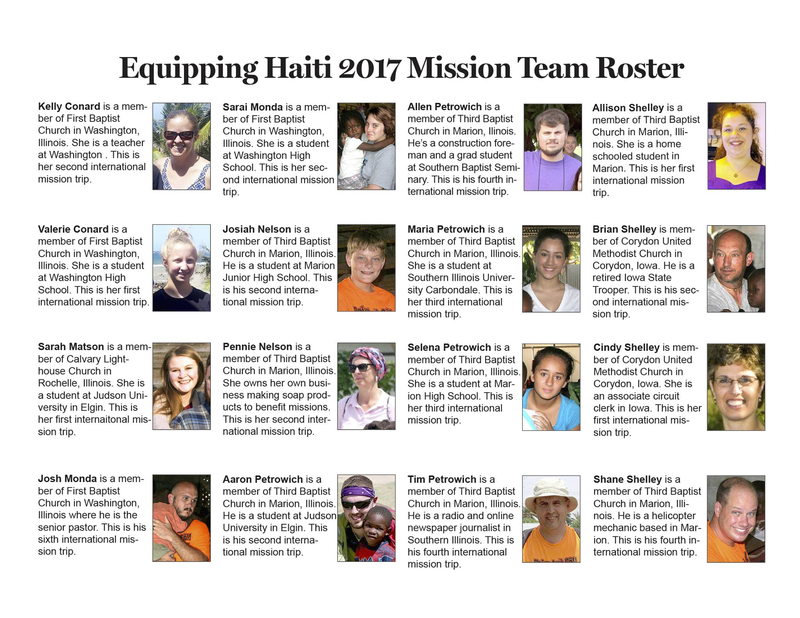 Four people from First Baptist Church in Washington are going with Equipping Haiti to Haiti July 11-19, 2017 to fulfill these projects. To complete the mission, including transportation, lodging and supplies, the total cost is $6,000 for the people. That is $1,500 per person. We are asking that you please consider a financial contribution to the cost of the trip. Any amount is appreciated and qualifies as a tax-deductible charitable contribution. To make a contribution, please fill out this form and send it to the address on the form. If you would rather give through an online giving platform you may do so here Thank you and may God bless you. If you would like to better pray for our team you can download our mission team roster here.